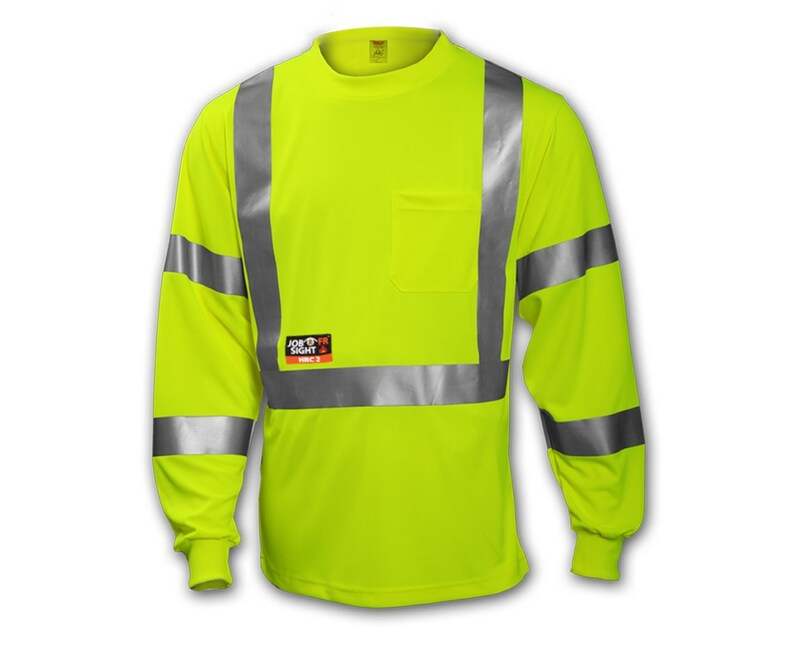 This High Visibility Flame Resistant Sweat-Shirt with Reflective Tape is a top quality worker’s t-shirt that was manufactured with the consumer’s satisfaction in mind, it has been put through testing guaranteeing its quality in regards to safety and comfort. Composed of 8.5 oz. 55% modacrylic and 45% cotton blend material and stitched with 100% aramid thread providing excellent stretch, breathability and comfort, at the same time providing safety with its flame resistant rating of ASTM-F1506 and an arc flash rating of 8.8 cal/cm² thereby allowing you to work at ease. Its ANSI 107 class 3 rating of high visibility and its 2” flame resistant silver reflective tape will allow you to be seen in low visibility situations which will help you be distinguished in time of danger or to vehicles when working on the road during nighttime. This t-shirt conforms to NFPA 70E and is HRC 2. Includes 1 front pocket, with FR rib knit sleeve cuffs that constrict, preventing dirt from entering. It is a comfortable roomy t-shirt that will keep you visible in your work zone. Top quality worker’s Sweat-shirt, manufactured with the consumer’s satisfaction in mind that has been put through testing guaranteeing its quality in regards to safety and comfort. Composed of 8.5 oz. 55% modacrylic and 45% cotton blend material and stitched with 100% aramid thread. Its material provides excellent stretch, breathability and safety. Its flame resistant rating of ASTM-F1506 and arc flash rating of 8.8 cal/cm2, will allow you to work at ease. 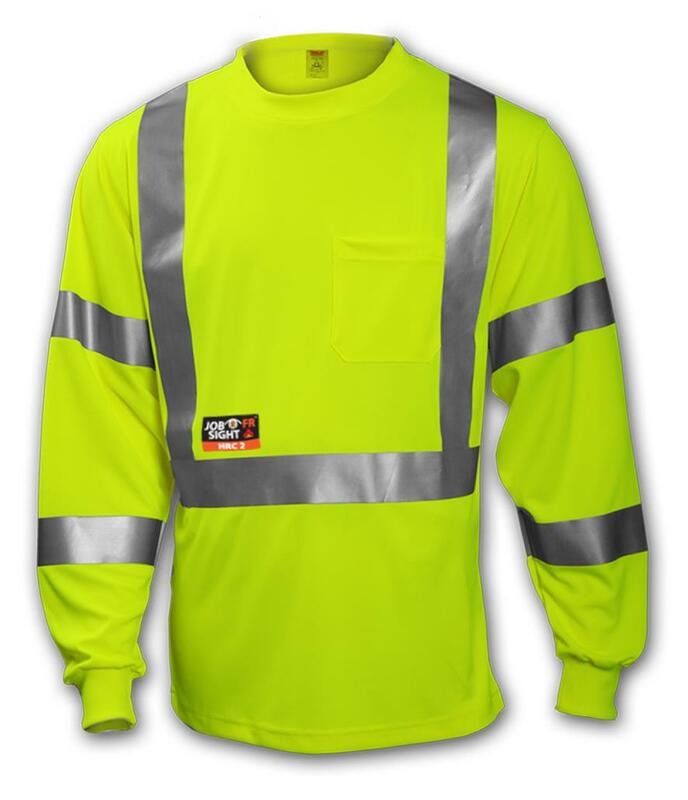 Bright fluorescent yellow, will allow you to be distinguished in time of danger or to vehicles when working on the road during nighttime. Includes FR rib knit sleeve cuffs that constrict to prevent dirt from entering, along with one external pocket.